We were to abstract a landscape for this lesson. 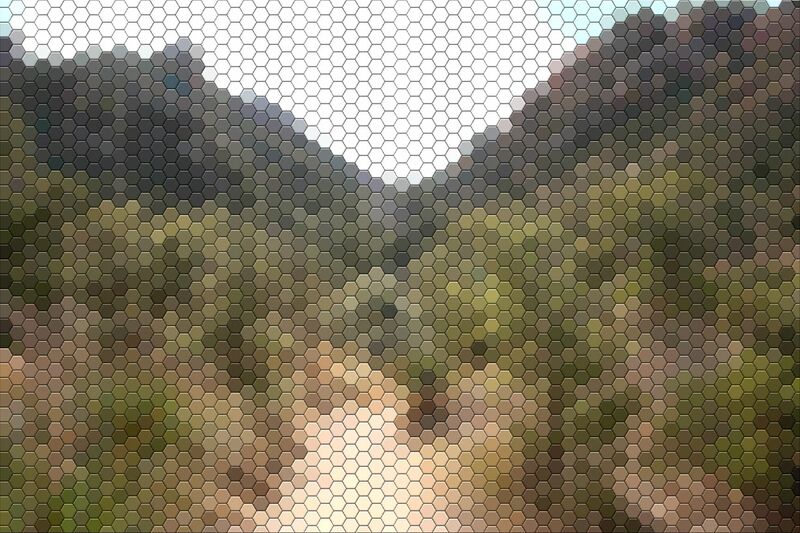 I did it by using a photo from one of my trips to Arizona. I tried quite a few effects before I liked the image. I used Posterize to highlight and intensify the scenery. Then I tried various tile effects with different angles. The hexagon shape at 0 was my favorite. Hexies are experiencing a resurgence in popularity, and this design could definitely be made – just not doable in a little over a week, especially when I have another 2 lessons to complete. I know this isn’t what Katie would like to see, but having to make 8 quilts in 16 weeks with very specific parameters has been daunting. Only one person in this class has managed to keep up. Some have dropped out, and all the rest of us are behind. It’s amazing to me, that I’m right behind the person who has managed to keep up. Two more to go in a little over a week – do you think I can do it? I hope so. Are they not adorable? 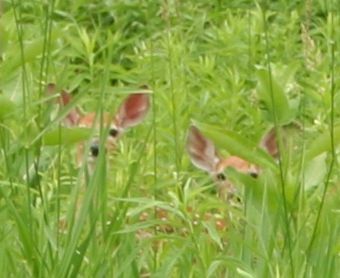 If you click on the image, it will enlarge, and you should be able to see the spots on the fawn on the right. Sue came up with a great idea for this month’s meeting – Dual Images by Dilys Fronks. You can download a pdf file by clicking on the link that gives an introduction to the technique. She was influenced by the Art Deco movement – especially Erte. I have no clue how to put the accent mark over the last e, but one belongs there. The high contrast colors she selected worked perfectly for this technique. 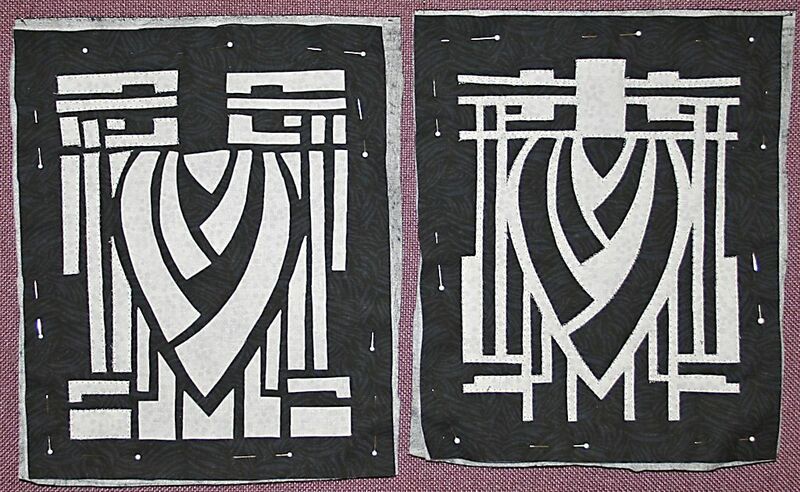 I brought a quilting pattern to use as a stencil, but it did not work well. While I didn’t come home with a work in progress, I did learn the ins and outs of how to create the positive-negative images, and my mistake of selecting a design that didn’t work well helped everyone learn which designs worked best. 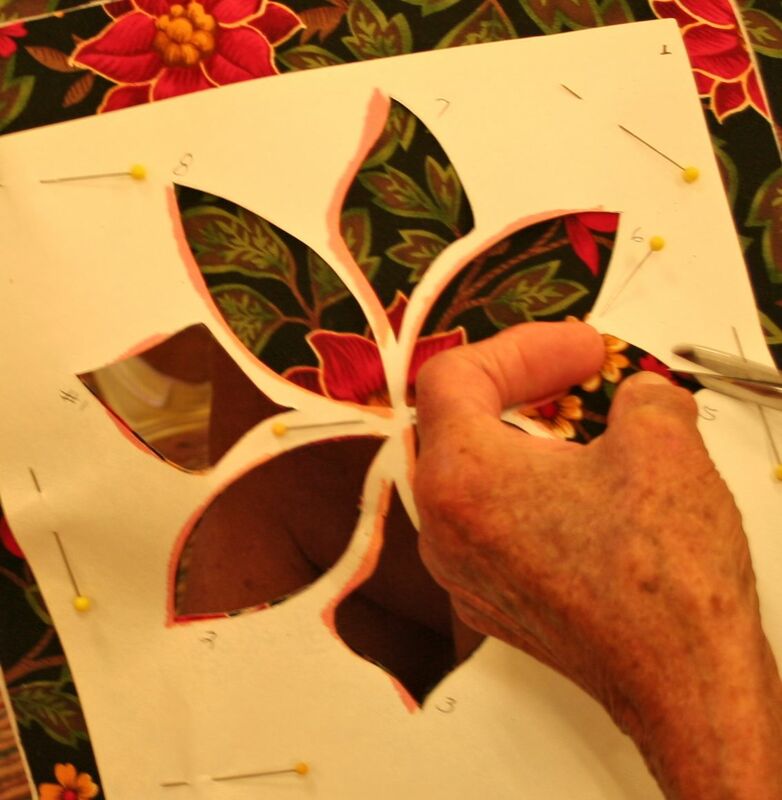 Sue wanted a mirror image of a pattern, and was experimenting with folding the fusible, and cutting out her design like you would a paper snowflake. We all learned some of her ideas worked well, and one of them ended up with the fusible on the wrong side of the fabric. Instead of using scissors, I used an Xacto knife to cut some of the smaller pieces, and am very happy with how this turned out. It will be made into a small wall hanging. I love the positive-negative images next to each other. It’s perfect for this Gemini. It’s got that duality thing going for it. And I totally avoided the fusible possibly being on the wrong side of the fabric by selecting a batik fabric. It looks the same on the front and the back, so I had no problem getting a mirror image of my design. I hope some of you go get the pdf file and try this for yourself. If you do, please drop me a note and share a picture. I’d love to see what you do with this technique. The 2 black palm fronds in the foreground are an experiment. 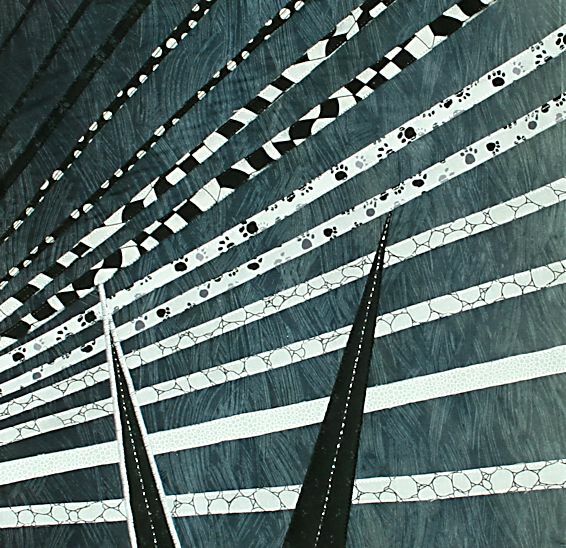 I’m waiting for feedback from Katie as to which one fits the criteria for this piece best – the one edged with white thread, or the plain black one. When I find out, I’ll pass on the info to all of you too. Every one of these lessons challenge me. I prefer lots of feedback on a project. What can I say? I’m a talker, joiner, socially oriented, and take a very long time to come to a design decision. Receiving a lesson, then working on it with no discussion, is a different process for me. I’m finding merit in working this way. Never thought I would, but I find I’m creating pieces that are very different from anything I’ve made in the past. 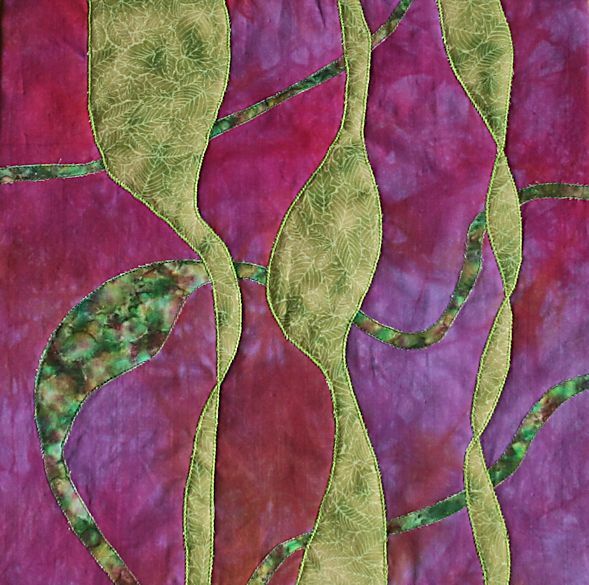 This piece was created using Ellen Lindner’s reverse double applique technique. It’s a raw edge applique technique which I really liked trying out. The lighter green fabric frayed along the edges way too much for my liking, so I created a slanted zig-zag stitch in my sewing machine, and used that edge sewing as the quilting also. 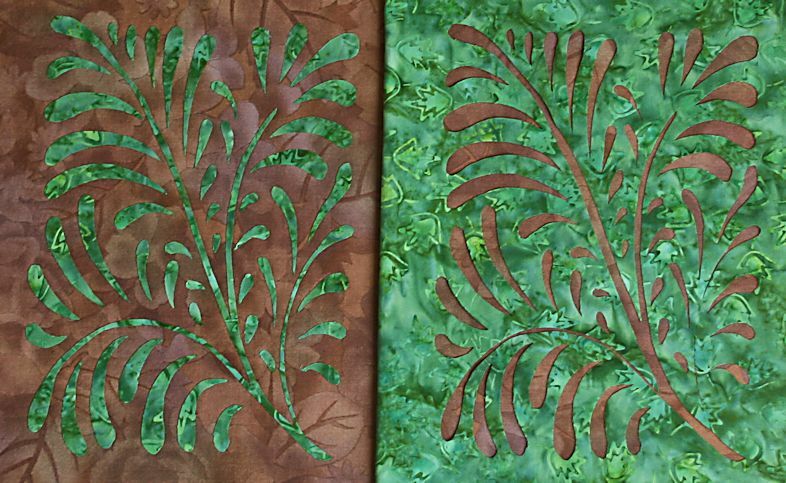 The background fabric was a hand dyed piece I received in a swap almost 10 years ago. I have a whole bag full of the fat quarters I received in that swap, and have been saving it all for who knows what reason? It makes no sense to let any fabric languish in a dark closet – especially hand dyed fabric.